Genuine Williams Brothers 1/4 (12" Dia.) 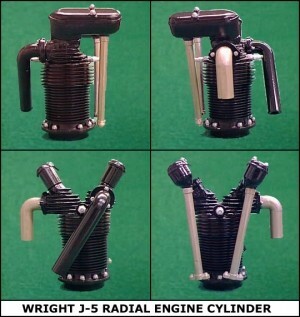 Scale WASP Dummy Radial Engine Kit. Kit to construct one cylinder with intake, exhaust, push-rod tubes & rocker covers. A completed scale engine would be 1 5/16" High x 3 3/4" Diameter. Photo shows completed and painted kit. 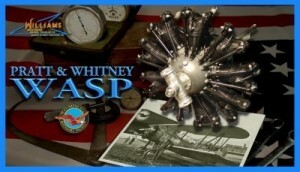 Genuine Williams Brothers 1/5 (9.6" Diameter) Scale WASP Dummy Radial Engine Kit. Color photo is example image from Williams Brothers site. This is a kit that must be assembled and painted. 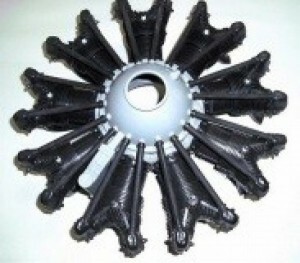 Genuine Williams Brothers 1/6 (8" Diameter) Scale WASP Dummy Radial Engine Kit. Temporarily out of stock due to Williams Brothers production delays, sorry! We're expecting a fresh supply soon! 1/4 Scale, Williams Brothers cylinder head for the Gnome Rotary 100HP engine. Included are plastic rocker arm/valve spring, pushrod and intake pipe. Includes drawing to make your own crankcase from wood or other material. Injection molded in black plastic, 3" high x 9-3/8" diameter, sold per one each. Temporarily out of stock, shipment pending factory production. 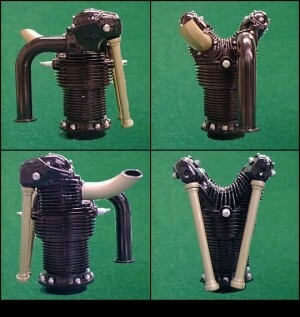 Kit to construct one cylinder with intake, exhaust, pushrod tubes & rocker covers. A completed scale engine would be 1 15/16" High x 5 5/8" Diameter. Photo shows completed and painted kit. Kit to construct one cylinder with intake, exhaust, pushrod tubes & rocker covers. A completed scale engine would be 2-1/2" High x 7-1/4" Diameter. Photo shows completed and painted kit. Kit to construct one cylinder with intake, exhaust, pushrod tubes & rocker covers. A completed scale engine would be 3-1/8" High x 8-3/8" Diameter. Photo shows completed and painted kit. Kit to construct one cylinder with intake, exhaust, pushrod tubes & rocker covers. A completed scale engine would be 3-3/4" High x 9-3/4" Diameter. Photo shows completed and painted kit. 1/12 Scale, Williams Brothers cylinder head for the Le Rhone rotary 80HP engine. You will need 9 of these to make a simulated 9 cylinder radial of the Le Rhone rotary engine. Included are plastic rocker arm/valve spring, pushrod and intake pipe. Includes drawing to make your own crankcase from wood or other material. Injection molded in black plastic, 1 cylinder kit 1" high. Completed engine would be 3" in diameter. 1/8 Scale, Williams Brothers cylinder head for the Le Rhone rotary 80HP engine. You will need 9 of these to make a simulated 9 cylinder radial of the Le Rhone rotary engine. Included are plastic rocker arm/valve spring, pushrod and intake pipe. Includes drawing to make your own crankcase from wood or other material. Injection molded in black plastic, 1 cylinder kit 1.5" high. Completed engine would be 4.5" in diameter. 1/6 Scale, Williams Brothers cylinder head for the Le Rhone rotary 80HP engine. You will need 9 of these to make a simulated 9 cylinder radial of the Le Rhone rotary engine. Included are plastic rocker arm/valve spring, pushrod and intake pipe. Includes drawing to make your own crankcase from wood or other material. Injection molded in black plastic2-1/16" high x 6-1/2" diameter. Kit to construct one cylinder with intake, exhaust, pushrod tubes & rocker covers. A completed scale engine would be 4" High x 4-1/4" Diameter. Photo shows completed and painted kit. Genuine Williams Brothers 1/6 (2") Scale Le Rhone Rotary Engine Kit. Developed shortly before 1914, these power plants were used extensively in World War I aircraft. 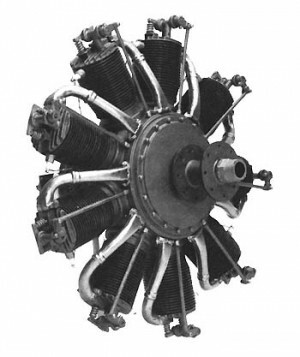 The engine revolved with the propeller, while the crankshaft remained stationary. Some of these units are still in action today, in reproduction, and restored in flying machines. Cylinders; Crankcase; Carburetor w/Sliding Valve; Accessory Drive Gears; Oil Pump; Magneto Wiring. Complete illustrated instructions. Display Stand included. Injection molded in black plastic, 6-1/2" diameter. Kit to construct one cylinder with intake, exhaust, pushrod tubes & rocker covers. A completed scale engine would be 1-15/16" High x 6-1/8" Diameter. Photo shows completed and painted kit. Kit to construct one cylinder with intake, exhaust, pushrod tubes & rocker covers. A completed scale engine would be 3-1/8" High x 8-7/8" Diameter. Photo shows completed and painted kit. Kit to construct one cylinder with intake, exhaust, pushrod tubes & rocker covers. A completed scale engine would be 3-3/4" High x 11-1/2" Diameter. Photo shows completed and painted kit.